Danigral - 4 out of 5. He is a great deal for icons and skill and willpower. Very well-rounded. The only thing is that he may be too well-rounded and by that I mean that often early game you can get by rushing with much fewer icons. So is it worth the drawback? Probably only in a deck that wants extra domains, like I mentioned on my comments for the Bureaucrat. mnBroncos - 3 out of 5. I can see rating this guy higher easily, however, with so many good characters with ability in the game I don’t know if the higher skill/icon ratio to cost is worth giving up an abiltiy for a downside. Obtuse - 2 out of 5. Initially I thought this guy was an absolute beast. Two cost, four icons, four skill! Willpower!? What an animal! If you’re out of open domains though you sadly won’t be sending King John anywhere. Kamacausey - 3 out of 5. What a spread of icons! And he has willpower too! King John came to play! His drawback is steep though and it's what keeps him from being a 5. He is powerful enough that he will see play but it will need to be in a deck that can mitigate his drawback with extra domains from eldritch nexus or something similar. livingend - 4 out of 5. Ah, the classic beatstick with downside. Not necessarily a design novelty, but as long as it pummels your opponent, who really cares? John probably goes best with a resource denial or domain creation theme (or just straight-up not having many early drops), the former of which received a lot of new tools in For the Greater Good, so I guess he’ll be seeing play in at least some decks. Verdict: The King of one-ofs. WWDrakey & Ire - 2 out of 5. So, a 2 coster that you can't do anything with, unless you have a domain. And one that even then easily dies to a Black Dog. Or anything with 2 combat icons. Agency has a really solid set of options at this price-point, why tie down your hands (and domain) voluntarily? I think the ratings above are generally a little harsh. In a vacuum, yes, his drawback really hurts. 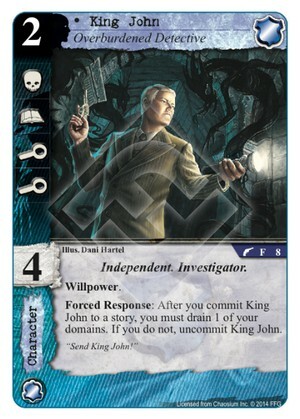 But this block of cards has Inspector LeGrasse, Bending the Rules, and other cards that refresh your domains and give you the ammo needed for cards like King John. Not a world beater, by any means, but I think 3 stars is very reasonable.